Each session includes two days of classes that will cover the operation and service of Eagle Iron Works equipment and training on Eagle Iron Works controls. The first day will include classes with breaks, lunch and dinner, and the second day will include classes, a tour of the Eagle Iron Works plant and lunch. Although the Sand Service School concludes with lunch on the second day, attendees are more than welcome to stay behind to chat with Eagle’s staff. Attendees can take advantage of discounted hotel rates up to two weeks prior to their confirmed session date. Eagle Iron Works will arrange transportation to and from the hotel each day, along with transportation to the airport at the end of classes on the second day. An Eagle Iron Works Water Scalping-Classifying Tank. Water Scalping-Classifying Tanks are capable of producing multiple spec products from a single feed. They separate particles in the feed material into various stations according to size and weight determined by the particles’ settling rates. A sand slurry feed enters the tank and is given an upward kick by an elevated lip in the feed box. This upward motion keeps medium and fine material from settling out too soon. The coarse material settles into the first stations, followed by the medium material in the next stations, and the remaining material settles in succession the length of the tank. Lightweight, deleterious material discharges over the weirs along with excess water. To create the desired product, valves located at the bottom of each station release a pre-determined ratio of material into collecting flumes, where they are blended to meet project requirements. An Eagle Iron Works Fine Material Washer washes, dewaters and classifies material in the field. 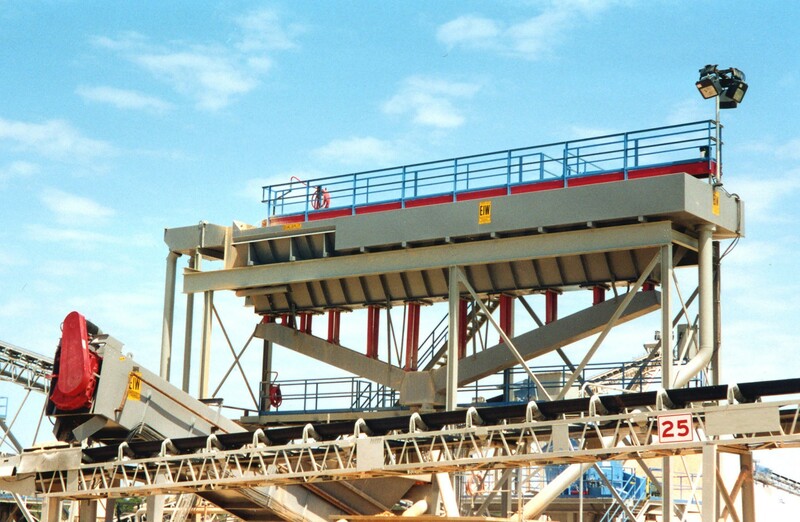 Fine Material Washers serve three main functions: washing, classifying and dewatering fine material feeds. Feed material that enters the washer box is cleaned through the material’s contact with the continuously rotating screw shaft, as well as the particle-on-particle contact as the material tumbles on itself. The velocity of the water entering the feedbox with the material also helps to remove any deleterious material from the particles. As the screw shaft turns, the feed material goes through the washer box and up the inclined tub, effectively dewatering the material since the water is allowed to drain out of the material due to the incline of the tub. The final function of a Fine Material Washer is classification. Classification is controlled by the Fine Material Washer’s adjustable side and back weirs. Adjusting the height of the weirs impacts the amount of fine material that is retained in the washer. Corrugated paddles on Eagle Iron Works Coarse Material Washers break down material as alternating screw flights convey it up the washer tub. Coarse Material Washers offer an effective way to remove soluble clays and dust coatings from feed material using a combination of scrubbing and washing to achieve the desired result. Coarse Material Washers feature rotating screw shafts equipped with alternating paddles and spiral flights. Combined with the tumbling motion the rotating screw shaft creates, the corrugated paddles provide the scrubbing needed to abrade and break down the soluble material and remove deleterious coatings, while the material’s contact with itself as it tumbles aids in this removal process. Unwanted lightweight materials, such as sticks, twigs and coals, are floated out of the Coarse Material Washer by a rising current manifold and discharged with the overflowing wastewater. 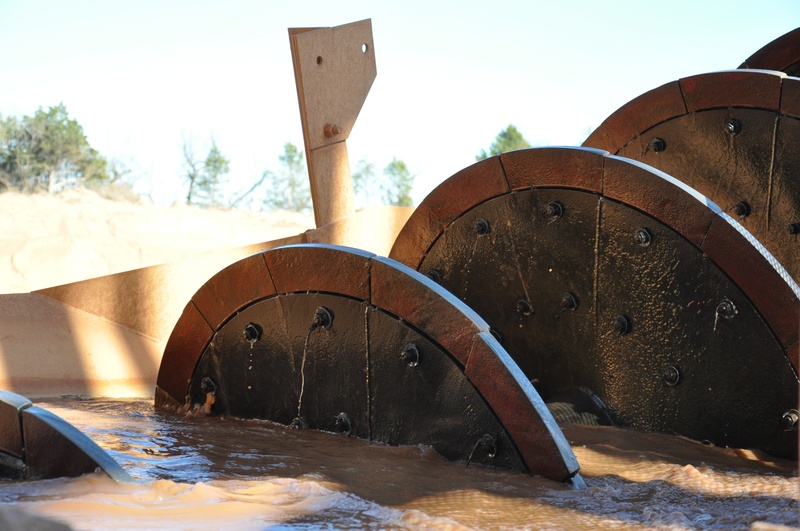 Eagle Iron Works Log Washers feature corrugated paddles the length of the screw shafts to provide the maximum amount of scrubbing of tough-to-remove materials. 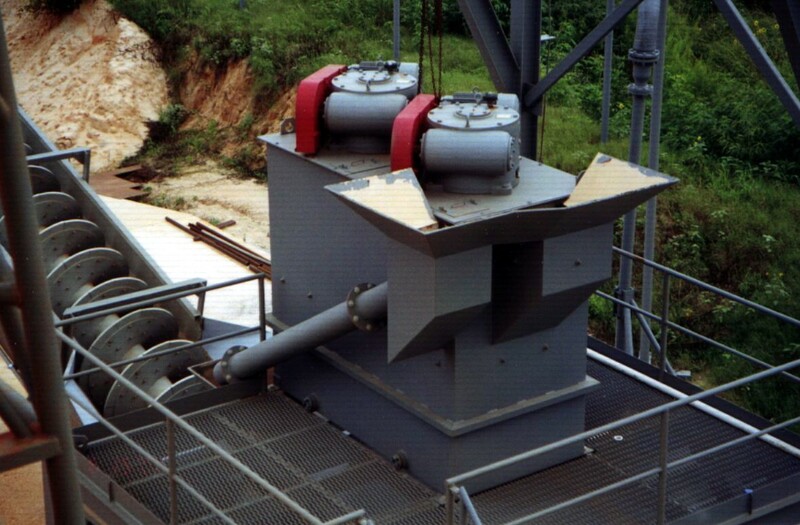 Log Washers are used to remove tough, plastic and insoluble clays and conglomerates from material feeds. 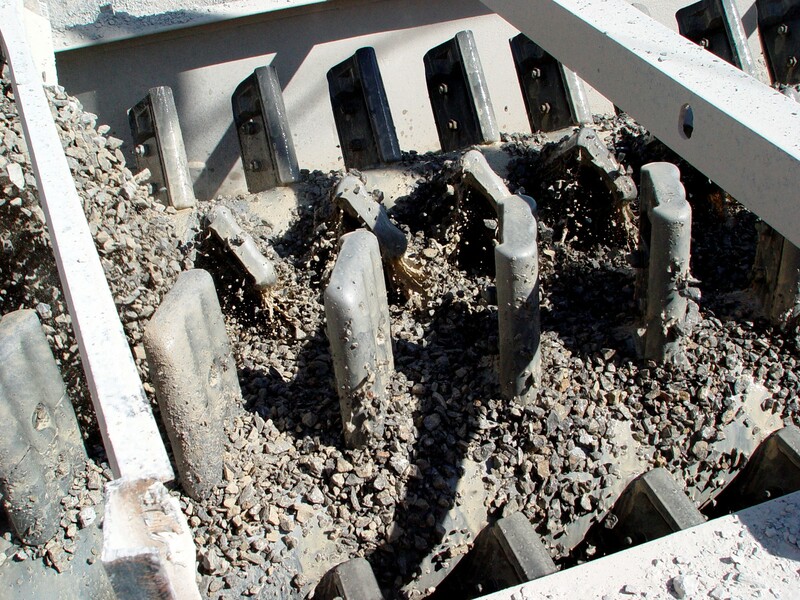 Like Fine and Coarse Material Washers, Log Washers feature rotating screw shafts, but these shafts are entirely covered with massive intermeshing paddles that are corrugated to provide heavy-duty contaminant removal and allow maximum rock-on-rock scrubbing. A rising current manifold in the rear of the machine helps to remove foreign materials, such as soluble clays that require more water for removal than insoluble clays. Any films or residual material left over from the scrubbing process can be removed with a rinsing screen following the Log Washer. An Eagle Iron Works Sol Clay Washer. Sol Clay Washers fall between Coarse Material Washers and Log Washers in terms of scrubbing capabilities. They are ideal for removing stubborn soluble clays and crusher fines and dust from material feeds. 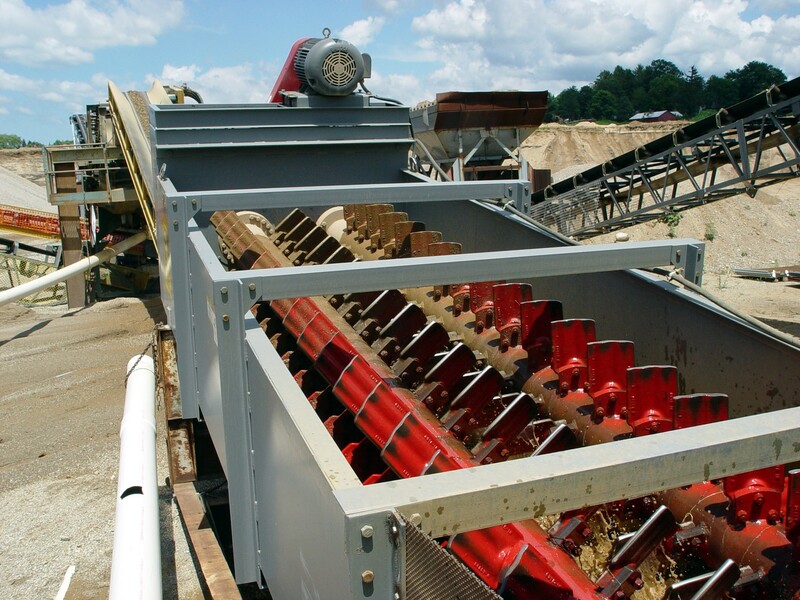 Like Log Washers, Sol Clay Washers feature intermeshing corrugated paddles attached to rotating screw shafts. These paddles cut the material and move it forward, breaking down softer clays into soluble slurry by their contact with the material and by the material’s particle-on-particle contact with itself. 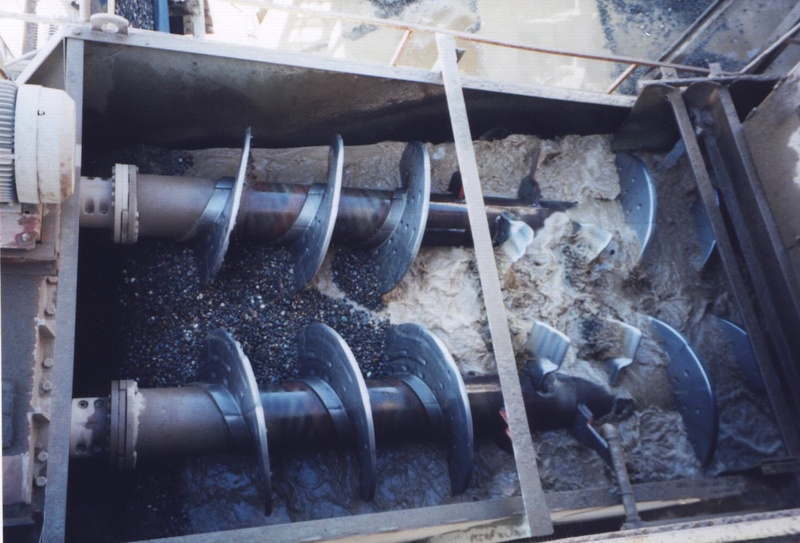 Water can be added to the rising current manifold in the rear of the machine to aid in flushing the dissolved materials over the weirs. A rinsing screen following the Sol Clay Washer can easily removal any residual films leftover from the scrubbing process. An Eagle Iron Works Attrition Mill. Eagle Iron Works Attrition Mills provide high-intensity scrubbing by subjecting the material to consistent particle-on-particle scrubbing as it moves through each of the Attrition Mill’s cells. Each cell contains a shaft with two five-bladed propellers. The top propeller is set to push the material through, and the lower propeller is set to retard the material passing. This forces the individual particles to grind against each other. The weight of the material being added to the mill is the force pushing the material through the Attrition Mill. After learning about each piece of equipment, its controls and how it functions, Eagle Iron Works will then share how to improve your production using their equipment. Upon completion of the classes, you will receive a certificate of training presented by Eagle Iron Works. Registration for Eagle Iron Works’ fall and winter Sand Service Schools tends to fill up quickly, as each session is limited to 20 people, so don’t wait too long to secure your seat! Sign up by clicking the button below. Simply fill out the registration form with your contact information, choose the dates you’d like to attend and click submit. Please submit your registration at least four weeks prior to the session dates you’d like to attend. Attending with colleagues? You can apply for your selected date together by including each attendee’s name and email address in the registration form. Once you submit your registration, wait until you receive a confirmation letter that your request was accepted before making any travel plans. Your confirmation letter will contain further information on lodging and making reservations for your stay, transportation options and payment information. For more information, visit http://info.eagleironworks.com/serviceschools.